Books: We got Max Found Two Sticks by Brian Pinkney from our local library. 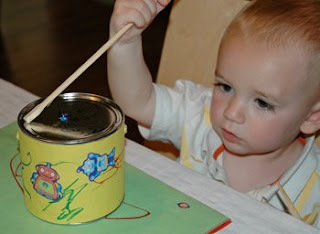 It is a nice story about a little boy who is inventive about making rhythms with found objects. 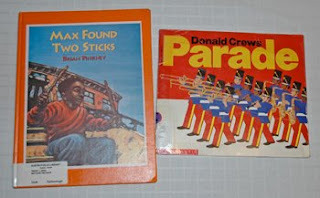 We also read Parade by Donald Crews, and the simple text and colorful images caught the attention of my boys. Activity: Drums -- We knew we were getting together with some friends for an attempt at a parade. 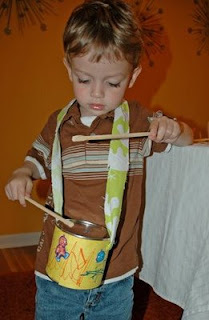 So we thought making drums would be a great project. Prep work: First I saved up some old small snack canisters. The peanut container seemed to be a good size, for example. I glued construction paper to the outside and let it dry. 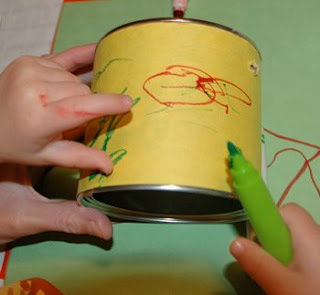 Kids work: Both of my sons got their own canister and decorated it as they wished. My eldest preferred stickers while my youngest really liked coloring it with markers. 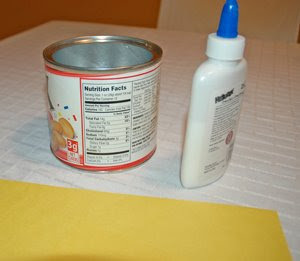 More Mom work: When they finished the decorating, I drilled two small holes in each side of the canisters. 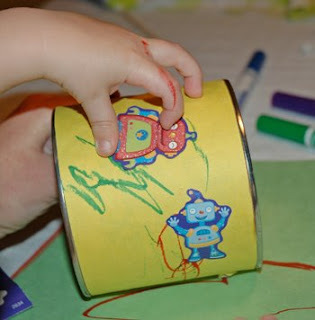 I then took thin strips of old scrap fabric and looped it through the canisters. 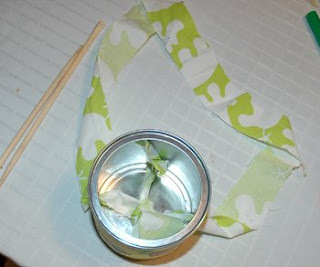 I tied the fabric into a knot on the inside of the canister. The fabric would serve as the strap for the drum since they were going to march with them for the parade. Then, I gave each child a set of chopsticks and let them play!